Denomination : silver tetradrachm. Mint : Messana. Size : 24.9 x 25.5 mm. Weight : 17.17 grams. Reference : Sear-851. Caltabiano 494.4, SNG ANS 357 (same obv. die); SNG Lloyd 1094 (same dies). Grade : gXF. 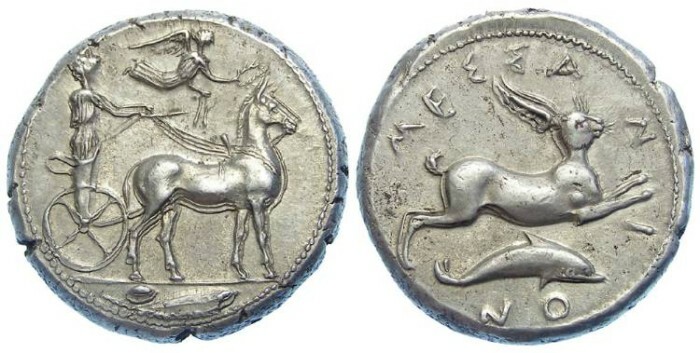 Just a slightly double strike, most evident below the horse's belly, but which is less noticable on the actual coin than on the image. Below I reference three coins from one or both of these dies sold at auction in recent years, and it should be noted all three show some of the same doubling, as to many other coins in this series. This coin has tremendous eye-appeal when viewed in person. Obverse : Charioteer driving biga of mules right, holding reins; Nike flying right above the mules she is crowning. In the exergue is an olive leaf and fruit. Reverse : Hare bounding right, with MESSANION starting at about 8 o'clock and going around clockwise. Two other coins that appear to be from this set of dies, and one with the same obverse die, sold at auction in recent years, none of which I feel are as nice as this coin. 1) CNG mail bid 75, lot 70 (May 2007) sold for $3750 plus the buyers fees (so about $4300) in gVF with minor roughness. Struck at the same die state as this coin. 2) H. D. Ranch GMBH, aution 82, lot 45 (April 2008) sold for 3200 Euro plus the buyers fees (about $4720 US, although at that time it was closer to $5500 US). A little softer looking and struck at a much later die state. 3) Numismatica Ars Classica, auction 46, lot 199 (April 2008) had the same obverse die, but a different reverse die sold for $15,000 CFH plus the buyers fees (currently about $16,000 US dollars). Slightly better centered as our coin, about the same grade, but in a later obverse die state, and with a minor flan flaw on the obverse.